AKRON — As children prepare for school to start at Tippecanoe Valley, the corporation is also preparing activities to engage and excite them. 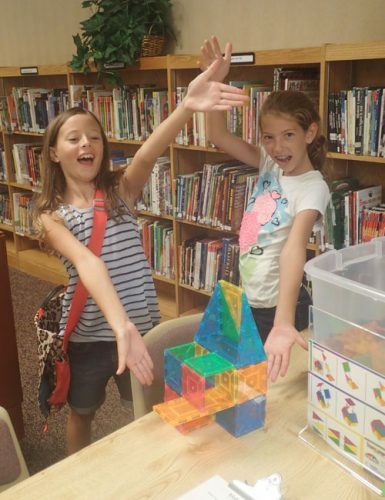 One of the programs that is sure to do this is Akron Elementary’s new makerspace in its school library. The makerspace will focus on science, technology, engineering and mathematics capabilities by providing children with ample opportunities to observe these concepts in action and, in some cases, engage with them through various stations set up around the library. Some of these areas include an ant farm, rotating solar system model, microscope station and Lego architecture area. There are even art-related stations, including ones dedicated to origami, sewing and crocheting. In total, there are nearly two dozen activities from which students can choose. Each of the stations is arranged in a way that encourages children to not only engage with the activity at hand, but dive deeper into their area of interest with books related to the activity set up right at the station. Some of the ideas for stations came from both parents and students. One fourth-grader expressed a passion for video game design and suggested the program include a station devoted to this interest. When school resumes, other students sharing his interest will be able to explore electronic game design with computers dedicated to the activity. This is only one example of the makerspace fueling students’ passion for learning. Students will be able to utilize the makerspace during part of their regular library time; classes may also reserve some of the activities during class time to reinforce what they are learning in the classroom. Akron Elementary’s makerspace was made possible by a generous grant from the Dekko Foundation. School librarian Andrea Michel could not contain her excitement about the space and her appreciation for the grant funding that made it possible. “We are very thankful and blessed to have received this grant from the Dekko Foundation,” she said happily. Final touches are being put in place before school resumes on Monday, Aug. 8, and soon, Akron Elementary students will be even better equipped to be outstanding today, tomorrow and beyond.